There comes a time in the life of the modern gentleman when he needs to wear a shirt and tie. Be it a wedding, funeral, job interview or a morning before the magistrate answering difficult questions about that cracker of a practical joke at the zoo of which we no longer speak. It’s all very well picking up the latest stay-pressed shirt from those excellent coves at Marks and Spencer, but we have no truck with short cuts when it comes to dressing like a true gent. We wear a suit that doesn’t come with its pockets sewn up, and our socks are the finest black from those extraordinarily tasteful Socked chappies (that’s us). We have standards, and our shirts have to be freshly pressed. Of course, you could pay a dry-cleaner to do the job, or even retain the services of a gentlemen’s gentleman. The lowliest curs will expect their mother to press their shirts, a habit that has only two outcomes: Damnation and Hell-Fire. 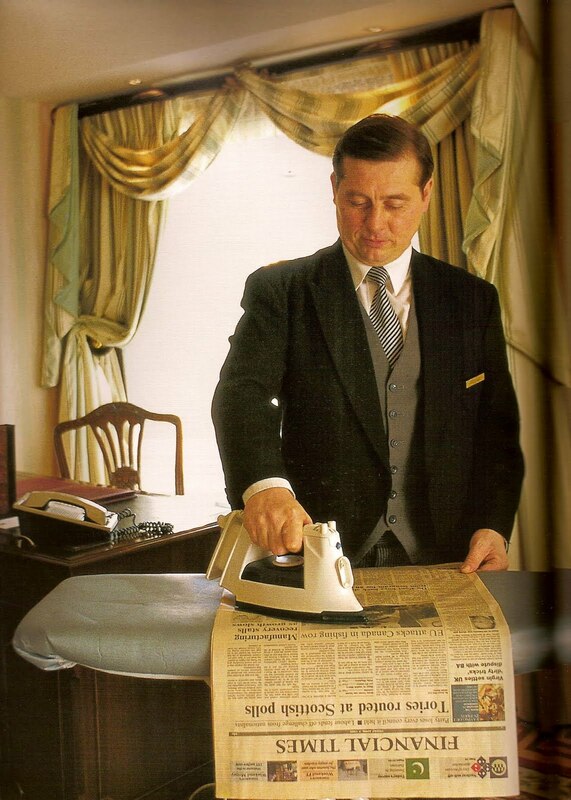 We are not your mother, but we will – just this once – instruct you in how to iron a shirt. This is how I do it, and get perfectly acceptable results, although others might have a different method. I was taught this particular skill by my mother – bless her soul – on the day she finally snapped, damned me to Hell-Fire and forced me to do my own laundry at the point of the family shotgun. I remember it well. I was thirty-five years old and running a diplomatic mission in one of the more unruly regions of Central Asia. It was not a good day. 1. Set up your ironing board and iron. Ensure the water reservoir is filled and the temperature gauge is set to the label on your shirt. If you need some moisture (which will be often to help remove the creases), press the steam button. Also, it looks impressive if you have an audience and makes it look as if you know what you’re doing. 2. Spread the collar out on the ironing board face down and iron flat. Then, fold the collar over as it would be word, and iron it gently. 3. Sleeves! Alas, poor mother was gibbering about the safety catch when we got to this part. But, from what I have gathered in the intervening years, spread the sleeve out as flat as possible with the cuff flat against the board, and iron. Turn the sleeve over and press the other side. If you’ve done it right you should see an acceptable crease down each sleeve. If not, wear a jumper over the top, or wear the shirt with sleeves rolled up in the accepted military manner (the subject of a future “How To” guide). 4. Now, put the “yoke” of the shirt (that’s the bit that sits on your back and shoulders) over what we call “the pointy bit” of the ironing board. See how well it fits? It’s almost as if it were designed that way. Press flat with the hot iron. 5. The rest of the shirt I like to think of as a large cylinder of cloth. Starting on the side with the buttons, lay flat and iron around them until the creases have gone. At this stage mother would have lost interest, and I began to contemplate my escape. 6. As each part of the main fabric is done, keep rotating the fabric so you do all of one side, the back on the side with the button holes. And before you realise, you have done. If a relative is watching over you with a firearm, slowly step away from the ironing board without making eye contact, then flee for your life. Otherwise, just put your shirt on a hanger and iron some more shirts. You are now ready to face the magistrate. Or are you? Oh no! You’ve forgotten your trousers! Coincidentally, I once had a dream about that according to a book I read (“The Gentleman’s Book on Dream Interpretation”) it means I have unresolved parental issues, and a future meeting judges and/or magistrates.